This was taken by our buddy Robert Burns of Sound Off Louisiana, at today’s meeting of the Baton Rouge Press Club. 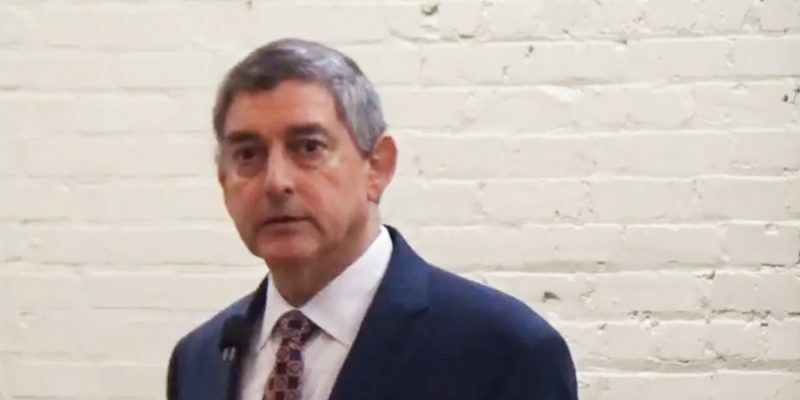 Burns asked Louisiana Commissioner of Administration Jay Dardenne two questions that, unsurprisingly, the legacy media types in the room didn’t have much interested in. First, given that Dardenne and his boss Gov. John Bel Edwards were pounded rather forcefully by the Senate Finance Committee Friday for having spent most of the week scaring senior citizens on Medicaid that some 37,000 of them would be put out of the nursing homes they currently reside in, and then whether Dardenne dismisses the rebuke given to him at the Friday Finance Committee meeting by Sen. John Alario for having embraced those scare tactics before the Senate had a chance to weigh in on the budget. Dardenne’s company line he’s touting is that somehow it was required, and just good, honest management, to send out those letters – and that if the administration was really looking for scare tactics they would have sent the letters out earlier. Ummm, OK. Because the advantage of sending the letters out earlier would have been what, exactly? To cause a public backlash against the administration sooner, and then to have the nursing home letter business blow over a week before the budget went to the Senate Finance Committee for a vote? And why the letters? Is there some difficulty in John Bel Edwards getting his message out through the legacy media that we don’t know about? The letters are supposed to be communication of the last resort. Edwards didn’t need letters to threaten to cancel college football in 2016 if he didn’t get the tax hikes he wanted then; he went on TV with those scare tactics. That Dardenne is still saying those letters were appropriate is a dead giveaway that the administration doesn’t know what to do. Which isn’t a surprise, given that ever since the budget crossed the marble from the House to the Senate they’ve been demanding that it be done away with – which was always a ridiculous demand; the Senate has been a rather slavish body in its devotion to Edwards’ wishes, but getting a majority for not doing its constitutional duty was always going to be a bridge too far. Punctuating that by dropping the nursing-home bomb on the Senate just as the Finance Committee was taking the budget up was only going to irritate the members of the committee and the body at large. Not to mention the public. Both Joe Cunningham and Conrad Appel have joined me in seeing this as a turning point for this administration, which has enjoyed non-stop cheerleading coverage from the legacy media and has generally ridden that to better-than-deserved approval ratings. But to have gone so far as to reach into the nursing homes to scare old people into demanding tax increases on a state whose economy has shrunk two years in a row was never going to be a winning strategy – and to be so adrift messaging-wise as Dardenne is in trying to justify that overreach on the basis of supposed legal necessity is an indication this gang never could shoot straight even if it had any intention of doing so.